Answer websites are the most convenient ways to get information nowadays, and sites such as Chacha.com and Quora.com are at the top of the heap. Both offer tons of useful and sometimes even just downright interesting bits of information, which makes them great fodder for comparison. ChaCha.com is a search engine that functions as a sort of question answering service. Utilizing a method known as the “human search engine”, ChaCha was invented by Scott A. Jones and Brad Bostic. The company’s headquarters are located in Carmel, Indiana. Quora.com is an “online knowledge market” that was established in June 2009. The beta version of the site was launched in December 2009, and a public version was available by June 21 the following year. Quora provides answers to questions of different topics, and allows users to collaborate on providing the answers. Quora was founded by Adam D'Angelo and Charlie Cheever. ChaCha.com has grown by leaps and bounds since its launch in September of 2006. As of 2010, the site had registered more than 17 million unique visitors, making it the 68th largest United States-based website. By November of 2010, ChaCha.com had answered more than 900 million questions, and the 1 billion mark was anticipated for December 2010. Quora.com for its part has received extensive funding from Benchmark Capital. Beginning inMarch of 2010, these infusions brought the value of Quora.com assets to its present estimate of $86 million. 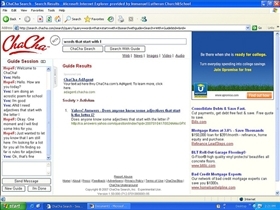 ChaCha.com was originally established with the goal of providing human-guided searches from a web browser, and for the engine to “learn” from results provided by independent contractors. By January 2008, ChaCha.com had introduced a new SMS service that allowed users to get answers to their questions via text messages. Questions asked by users will get them a short answer along with a link to a page that contains more detailed information, along with the name of the guide. Quora.com provides reusable “question pages”, in which other users can help provide answers. Each question is hosted on public spaces in which anyone can make edits for purposes of improving the accuracy and veracity of the information in the answers. 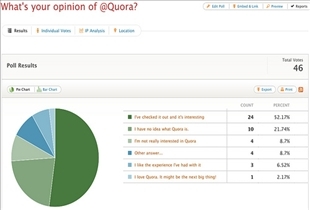 The company behind Quora.com obviously relies on its user base to make it a high quality source of online information. In a sense, it can be said that the site is under constant improvement, and the ratings system for answers ensures that the best answers always rise to the top. And since those answers are open to comments from other users as well, the information provided is constantly undergoing improvements. Which answer website is better? Quora seems more like wikipedia than Q&A except the community is comparatively small. At scale, quora will likely struggle with quality.